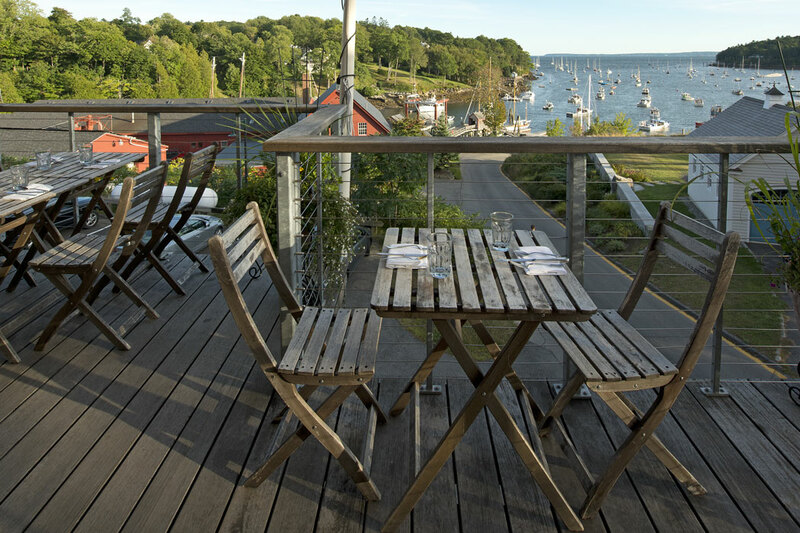 Can’t beat the view: The back deck at Nīna June looks out on Rockport Harbor. 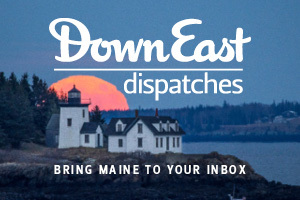 We’re not asking you to dine out at every amazing restaurant in Maine. Just these 20. 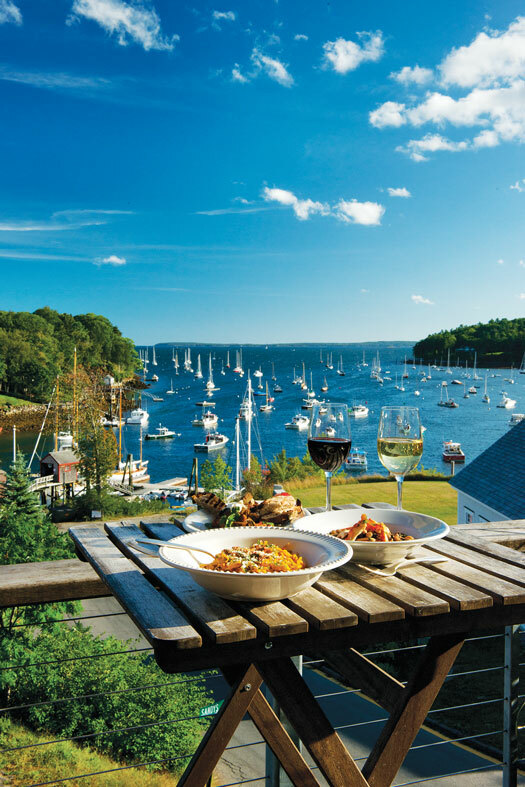 Dig in and explore the best seafood, best lobster roll and the most delictable restaurants in Maine. 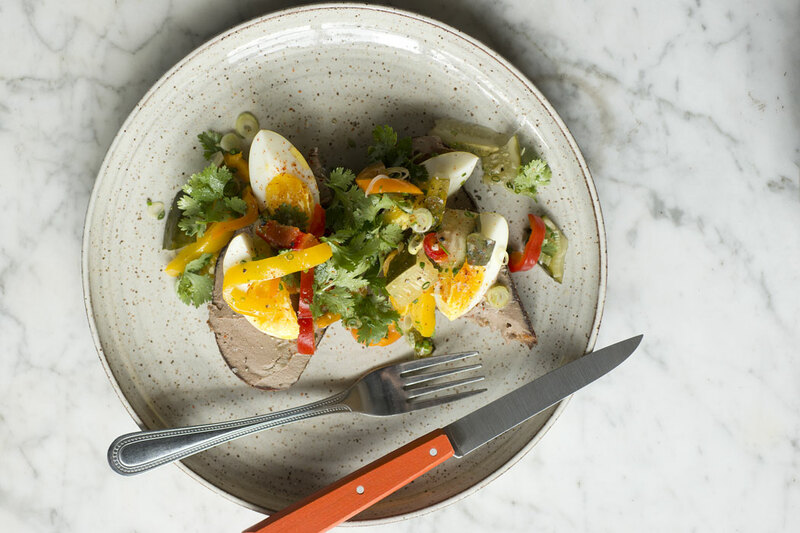 As colorful as it is savory: Chicken Liver Toast with pickled egg, cucumbers, and cilantro. Plating at Drifters Wife is impossibly artful. 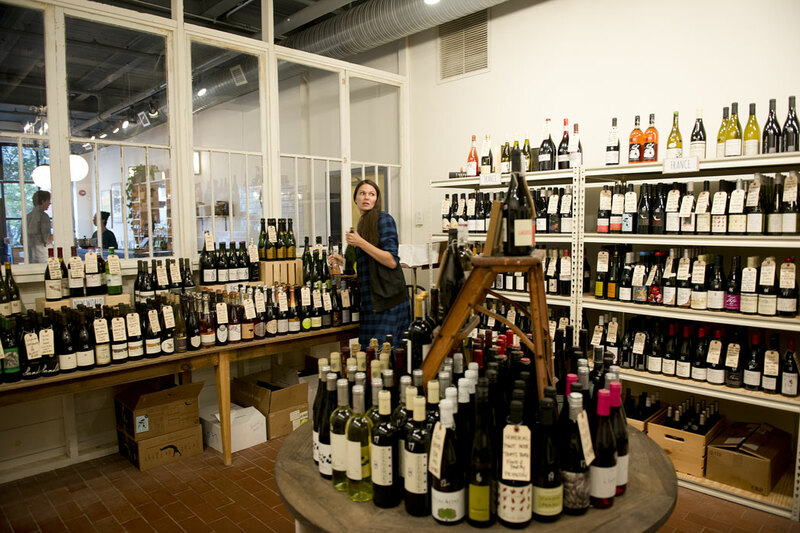 The glossy food mags keep dwelling on the relative Brooklyn-ness of Peter and Orenda Hale’s snug new wine bar, which fronts their two-year-old organic/biodynamic wine shop, Maine & Loire. “Feels like it could be in Williamsburg,” Food & Wine gushed. 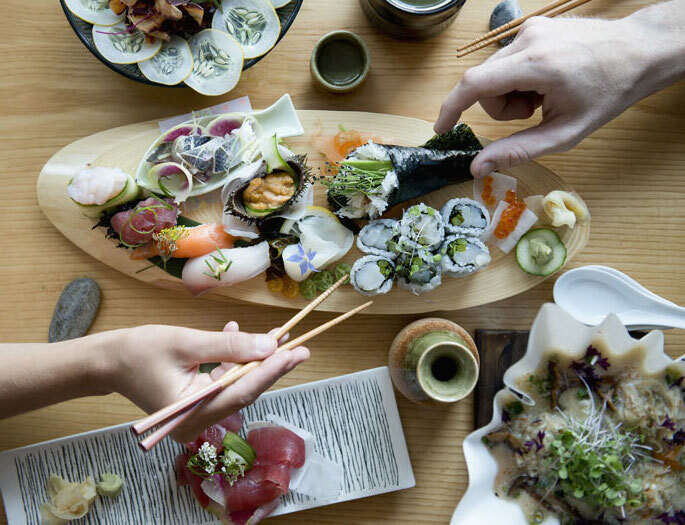 Nails a big-city date-night vibe, said Bon Appétit, hailing it as one of the country’s 50 best new restaurants, “but what makes it better is that you’re nowhere close to Brooklyn.” Truth is, its proximity to Brooklyn is the least interesting thing about Drifters Wife. 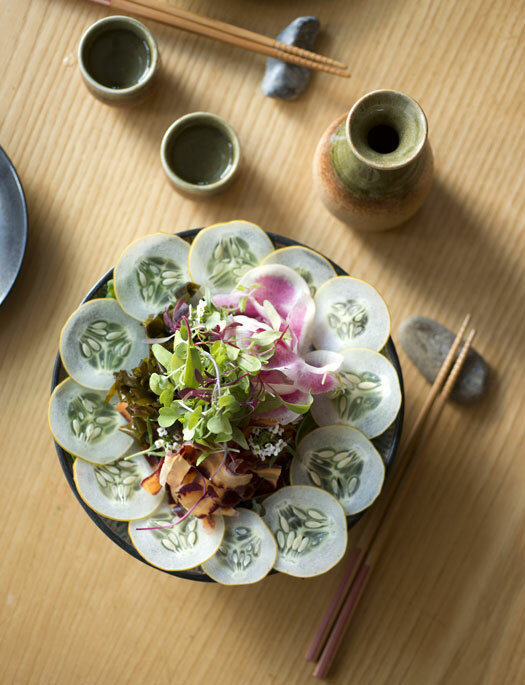 Chef Ben Jackson’s succulent, shareable dishes of local veggies and fish are exquisitely plated and prepped in a behind-the-bar kitchen using just an oven and a pair of induction burners. And that commitment to wholesomeness and simplicity? 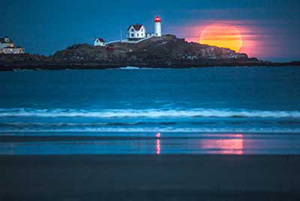 Sorry, Williamsburg, but that’s all Maine. 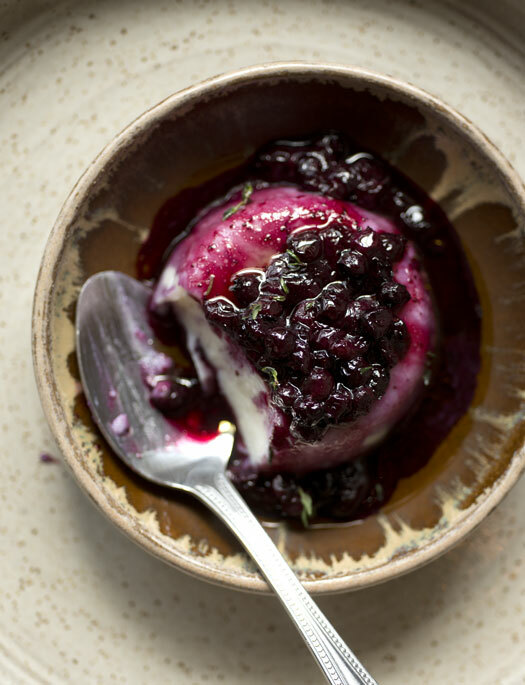 A malabi dessert (that’s Israeli milk pudding) with Maine blueberries is typical of the Drifters Wife intersection of cosmopolitan and hyper-local. 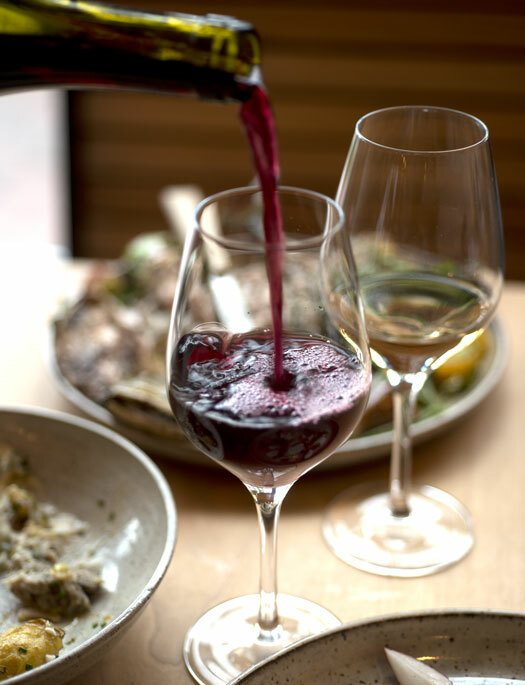 The restaurant shares its East Bayside space with the lovingly stocked Maine & Loire wine shop — needless to say, oenophiles will dig the bottle list. Portlanders hope that Woodford F&B heralds a trend: off-peninsula neighborhood joints with heavy-hitting kitchens that stack up against reservations-only hotspots downtown. Woodford serves up brasserie fare — a superb steak and fries, luscious deviled eggs, fork-tender pork chops — in a warm, family-friendly dining room of vaguely retro booths and wall tiles. Chef Courtney Loreg is a Sam Hayward protégé who spent four years as sous chef at Fore Street, plus another couple at Bresca. 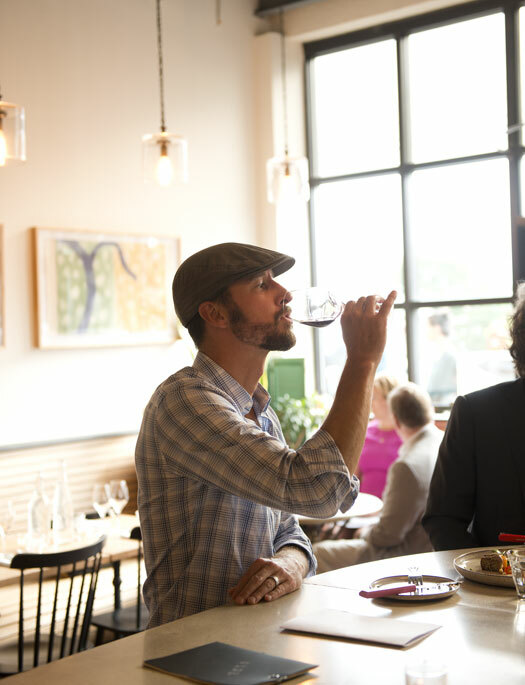 Casual and fun, Woodford is definitely Portland’s best and most welcoming restaurant that shares a building with a tanning salon and dry cleaner. Bon Appétit named East Ender among its Best New Restaurants of 2015, and Karl Deuben and Bill Leavy’s unassuming little gastropub has only gotten better. The duo, who first made waves with their Small Axe food truck, are still plating up comfort food that’s inventive on the margins: chicken wings spiced with vadouvan Indian curry, duck breast with a Scotch (duck) egg, etc. But it’s like they’ve only now fully settled into their non-mobile digs: execution is more consistent, service is warmer, and the bar crowd upstairs has come to think of the place as their own. We’ve only seen the beginning of the East Ender. 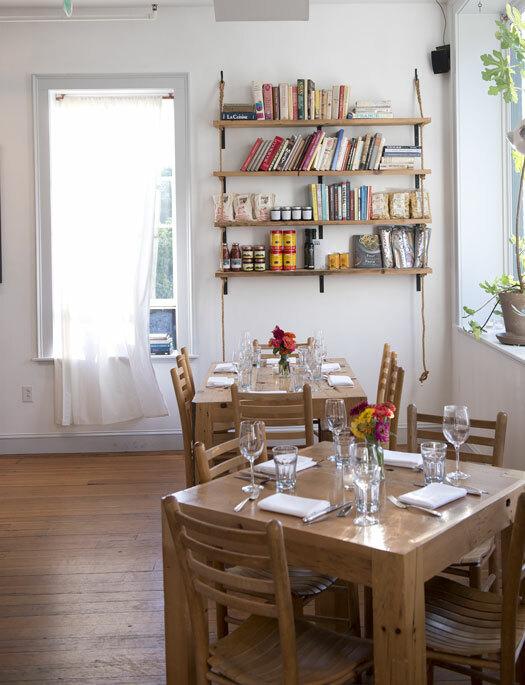 Revived last year and subsequently expanded with a nifty loft, Old Vines Wine Bar (173 Port Rd., Kennebunk; 207-967-2310) is as breezy as can be, and chef Joel Souza’s globally influenced small plates are ideal for casual courting. 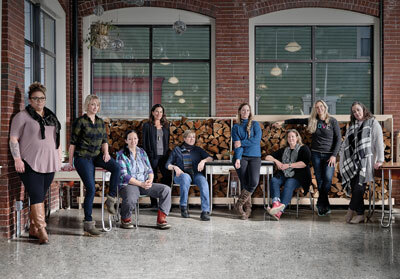 Four years in, Eventide Oyster Co. (86 Middle St., Portland; 207-774-8538) has lost none of its romance or cool. Praising its freshness and wine list, Condé Nast Traveler just called it one of the best restaurants in the world, so there’s that. 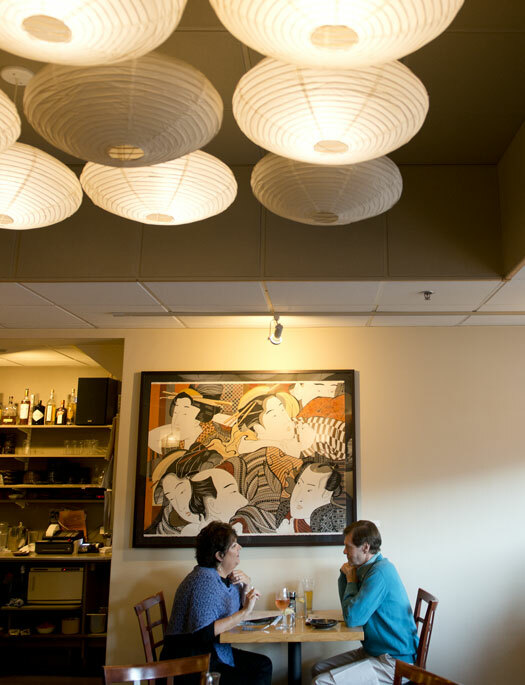 It’s been a decade since Keiko Suzuki Steinberger first lured diners to Rockland with her distinctive brand of sushi, which draws heavily from the local catch: halibut, mackerel, herring, tuna, whelks, clams. When a restaurant’s been around that long, it seems enough to hope for consistency. But Steinberger, a 2016 James Beard Foundation semifinalist for best chef, is ever more inventive in her approach to fresh morsels of seafood and veggies that arrive at each table like exquisitely wrapped gifts. Rockland dining is hot (note two entries on this list), and Suzuki’s is simply at the top of its game. 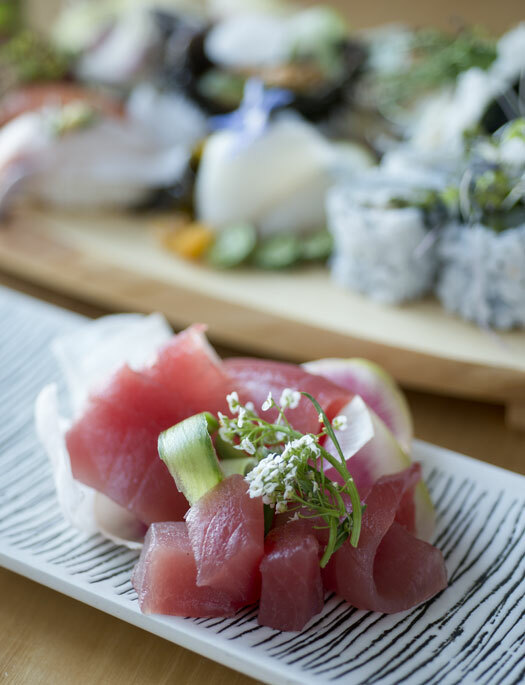 Ordering omakase at Suzuki’s gives you a chef’s choice of sweet, fresh sashimi and nigiri, with local veggies (and some lovely floral touches). With wakame, cucumber, and carrots atop local greens, even the house salad (right) is a thing of beauty. 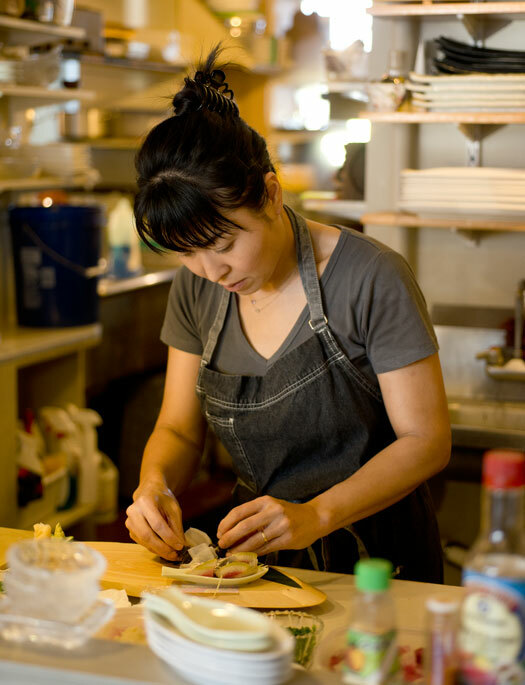 Now Beard-nominated, chef Keiko Suzuki Steinberger studied briefly at the Tokyo Sushi Academy but is mostly self-taught. 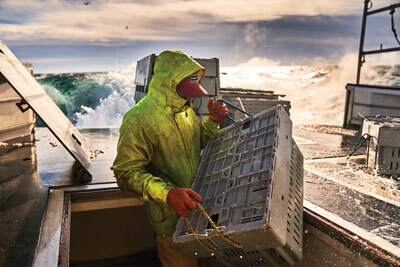 She buys fish straight off the Rockland docks. Sam Richman’s food is hearty, unpretentious, and exuberant — like a backyard cookout in spirit, but way more delicious. Richman, who previously headed up the kitchen at the now-defunct Salt Water Farm restaurant, is a master of home-style cooking — roast short ribs, chicken stews, hamburgers, and the like. He pumps up flavors by smoking, grilling, pickling, or rubbing with herbs, and he presses into service whatever fresh veggies and fruits he finds on his morning rounds. Desserts — warm, spiced puddings, ice-cream sandwiches, blueberry crisp — are likewise evocative of home. Sammy’s Deluxe is at once kinda retro and kinda new, which makes it kinda perfect for an old fishing port morphing into Maine’s hippest, artiest town. 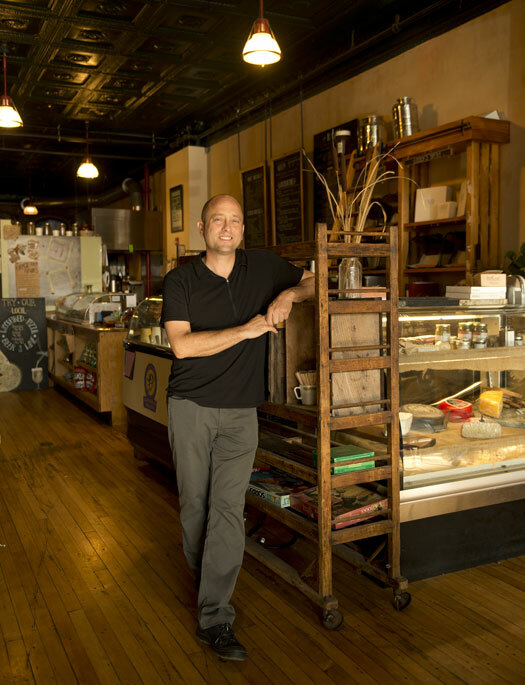 The best thing about Piccolo owners Damian Sansonetti and Ilma Lopez taking over Caiola’s (58 Pine St., Portland; 207-772-1110) this summer is that there are now two places to enjoy pastry chef Lopez’s amazing cakes, light gelatos, and inventive mousses and panna cottas. Beth’s Kitchen Café (108 Main St., Bridgton; 207-647-5211) seems more crowded these days than when it moved to its new building three years ago — maybe because Bridgton’s downtown continues to fill out, maybe because the cannolis, tortes, and other treats are getting even more decadent. 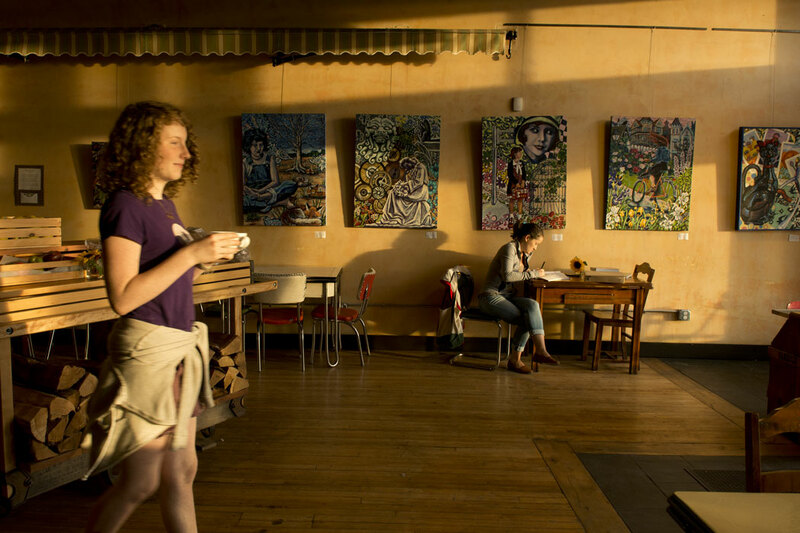 Until this summer, Forage Market was simply a chill coffee shop and café, most notable for its 120-year-old building (a one-time junk shop with exposed brick walls and dramatic high ceilings) and its hand-rolled, wood-fired bagels, a mix of Montreal and New York styles, melding the exterior crispiness of the former with the salty, doughy heft of the latter. Then, this summer, Forage launched its Thursday-through-Saturday pizza nights, transforming the place into a pubby community gathering spot serving creative wood-oven ’zas (try the sausage, fennel, and gruyère with white cream sauce) and pouring some powerhouse local beers (including a few from Bear Bones nanobrewery, across the street). 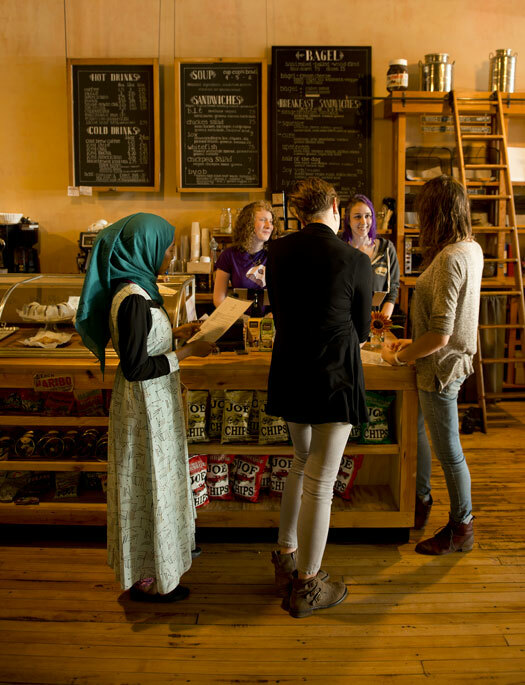 The epicurean ambitions, commitment to local sourcing, and hangout vibe are perfectly characteristic of the gradual re-awesome-ization of Lewiston’s Lisbon Street. 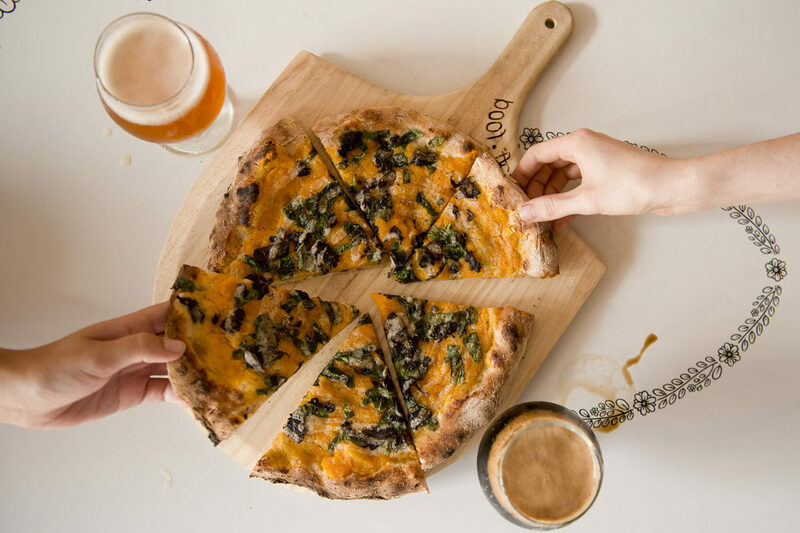 The veggie pizza at Forage Market, with sweet butternut squash mushrooms, spinach, truffle aioli, and plenty of beer. Owner Allen Smith had a high-school job baking bagels. 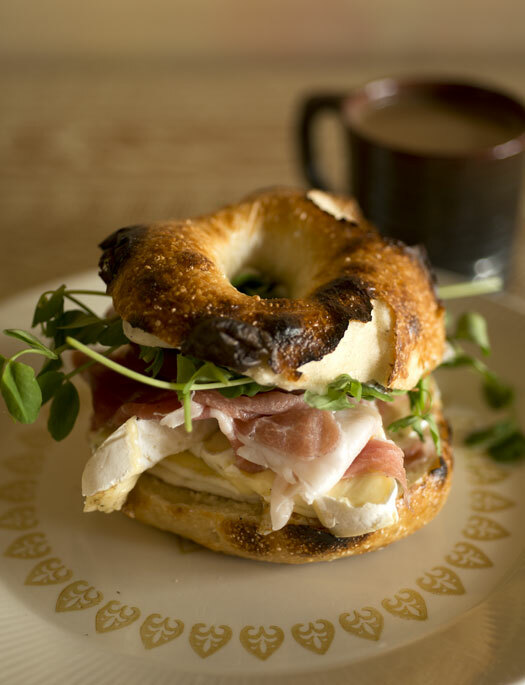 By day, terrific bagel sandwiches include The Cure: a local egg over easy with brie and prosciutto. One of the more charming recent trends in the food world has been a nostalgic fascination with old-fashioned Midwestern supper clubs — and similar big-feed palaces of retro gentility all across rural America. Aroostook’s Long Lake Sporting Club has been obscuring plates with their giant and hand-cut porterhouses, fried shrimp and steak fries, and hefty racks of ribs for almost a century. These days, the bar still bustles on the weekends, snowmobiles fill the parking lot in winter, and the complimentary ployes (and snippets of Acadian French) are a reminder that you’re definitely not in the Midwest. 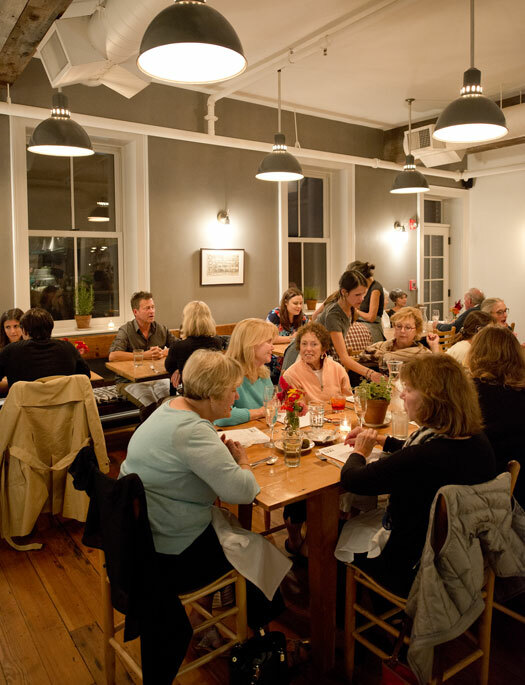 Yet unopened at press time, but we can’t wait to try: Spat Oyster Cellar (27 Western Ave., Kennebunk; 207-204-0860) is chef Rebecca Charles’ return to her summer bastion of Kennebunk after basically introducing NYC to the concept of a relaxed oyster bar some 20 years back. Krista Desjarlais, Beard-nominated chef-owner of Portland’s dearly departed Bresca, will do Montreal-style bagels, rustic pastries, and Roman pizzas at The Purple House (378 Walnut Hill Rd., North Yarmouth), her much-delayed wood-fired bakery (and one of the country’s most anticipated fall restaurant openings, says dialed-in food blog Eater). Sara Jenkins has been slow-simmering her Mediterranean-style restaurant, perched high above Rockport Harbor, for months. Part of a small wave of chefs with Maine roots returning from adventures in New York, the Camden-born Jenkins opened Nīna June without fanfare in late spring, serving deliciously distinctive brunches like lemon ricotta pancakes and shakshuka (eggs poached in tomato-red pepper sauce). A few weeks later, Jenkins quietly added Sunday lunch, with dishes reflective of a childhood spent in Italy and Lebanon, and of her passion for fresh, local ingredients (think spaghetti with Maine crabmeat, arugula, and lemon butter or grilled eggplant and spicy feta atop Middle Eastern flatbreads). 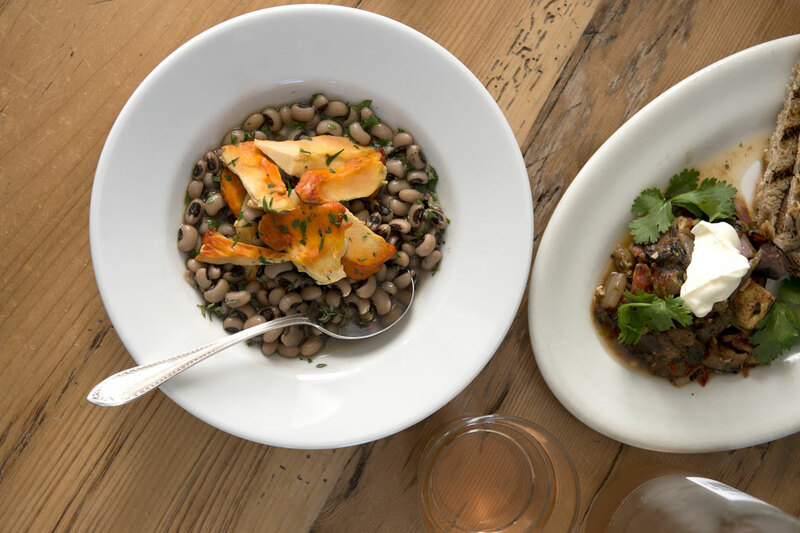 Finally, in September, Jenkins delivered on Nīna June’s summer-long tease, adding the kind of elegantly simple dinners that won her acclaim at Manhattan’s Porchetta and Porsena. Proof enough that anything worth having is worth waiting for. Borlotti beans with chicken of the woods mushrooms from Nīna June. Borlottis are big in Italy, where Chef Sara Jenkins spent her childhood. 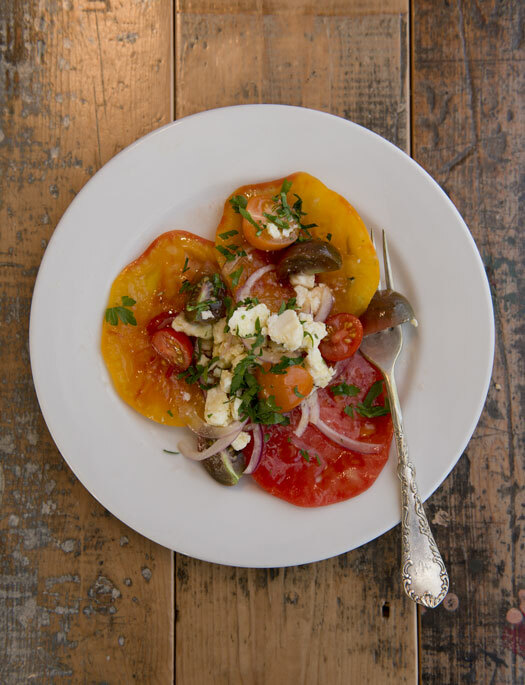 Dishes like the heirloom tomato salad reflect chef Sara Jenkins’ preference for simple, elegant plating. 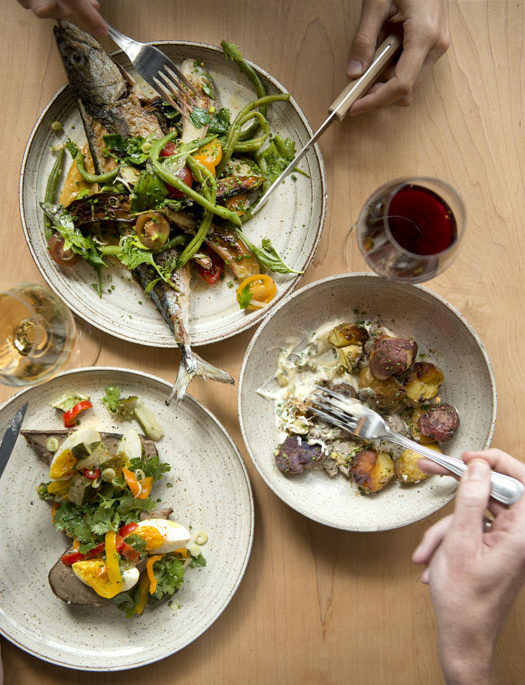 The Mediterranean vibe of the Nīna June menu is reflected in the restaurant’s seaside location and a trattoria-style dining room that keeps patrons sociably close to one another. 2 State St., Ellsworth. 207-664-1030. Ellsworth isn’t known for destination dining, so the lines at Serendib might take you by surprise. Standout Indian and Sri Lankan food is a welcome novelty on the midcoast, but the hearty, fragrant dishes coming out of Sanjeeva Abeyasekera’s kitchen could hold their own in Portland and beyond. Abeyasekera’s small menu sticks largely to the classics: curries, vindaloo, super chewy naan, and fresh, house-made paneer. One exception is the lamprais — a rich little package of mixed meat curry, eggplant, and sweet-and-spicy onion sambol, all baked inside a banana leaf. The dining room is no-frills, but for fans of subcontinental cuisine, it’s well worth a detour. With less irony than just boozy fun, Rhum Food + Grog (4 Free St., Portland; 207-536-1774; rhumportland.com) is the tiki bar Portland deserves. Blocks away, Andrew Volk keeps racking up awards at Portland Hunt & Alpine Club (75 Market St., Portland; 207-747-4754), including a “Best New Mixologist” nod from Food & Wine. In Brewer, Mason’s Brewing Company (15 Hardy St.; 207-989-6300) is bucking the taproom trend and bringing the brewpub back, with great views of the Penobscot River. And while vino gets top billing, Marché Kitchen and Wine Bar (40 Lisbon St., Lewiston; 207-333-3836) has house cocktails as elegant as they are potent. Try the New England Old Fashioned, which nods to our colonial history by adding a splash of gold rum to rye (both from Portland’s New England Distilling) and bitters (Maine-made, of course). Opened last year in the stately, curved Merchant’s Bank Building (which sat mostly vacant for the 15 years prior), this clubby dining room sweeps around the impressive spectacle of an open historic bank vault. Evenrood’s is an inviting spot for an after-work cocktail or a pre-concert dinner — even al fresco dining on the downtown sidewalk outside. The menu’s unpretentious, but the steak and seafood entrées are cooked well and served with cheer, and seemingly unimaginative apps are surprisingly flavorful — the mussels have a delightful kick thanks to red curry broth, the seared tuna hits the perfect ginger-soy-wasabi balance. Evenrood’s makes a sturdy, classic anchor for Bangor’s expanding downtown dining scene.  In 180 paces (we counted), you can traverse the nucleus of Kittery’s snug Foreside district, passing eight restaurants, a whole-animal butcher, an import market of Euro delicacies, a dim craft-cocktail bar, and a coffee shop with the best vibe (and crullers) for 50 miles in any direction. And Kittery’s epicurean uprising isn’t limited to Foreside. 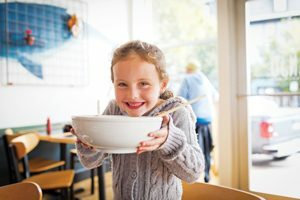 “The identity of Kittery used to be ‘We’re not Portsmouth,’ ” says restaurateur Michael Landgarten, “but now we’re our own thing. We’re a force.” And if you’re eating your way across town, a tour de force. See more!